Linear Speed Sessions: Parisi’s signature straight ahead acceleration and top speed running techniques. Change of Direction Sessions: Agility and ability to decelerate and move in any direction quickly. Upper Body Strength Training Sessions: Strength training exercise techniques and strength training information for the upper body. Lower Body Speed-Specific Strength Sessions: Strength training exercise techniques and strength training information for the lower body. Evaluation: Every athlete begins our program with an evaluation. This is used to assess current ability, identify strengths and weaknesses, and group athletes accordingly. Using the information from the evaluation, every athlete selects a program that is designed to fit their needs. This program will be some combination of Speed, Strength, Flexibility, or Nutrition training. 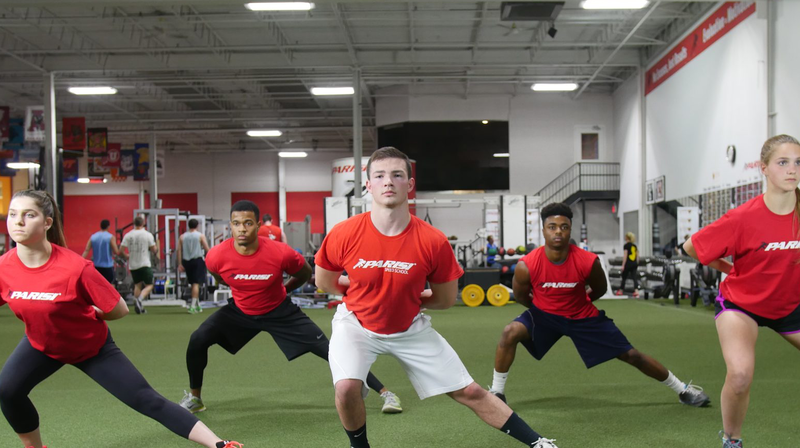 Speed Training: Our signature speed methods focus on improving an athlete’s technique and conditioning. This will lead to sprint efficiency and increased speed. Strength Training: Strengthening the muscles used in sprinting helps an athlete cover more ground per stride and be less injury prone. This education will also allow an athlete to properly train on their own when the program is completed. Flexibility: Increasing an athlete’s range of motion will allow for a longer, more efficient stride when sprinting, and decrease the chance of injury. This leads to a faster, safer athlete. Nutrition: Improving an athlete’s diet through education can create good eating habits, maintain an optimal body weight, and increase energy and self-esteem. These improvements help any athlete to be faster.